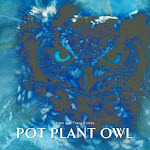 Pot Plant Owl: Day 2 - 4 Oct and is there another chick? No sooner had we confirmed that there was only one chick in the nest, and taken the picture below, then PPO started 'dancing'. From left to right she shuffled, her head dipping to the silent beat of Motherhood in her soul. We've seen this 'dance' before, and we suspect (but can't yet prove) that the cause of this 'John Travolta' behaviour comes in a package that is white, tiny, fluffy and adorable. You guessed it - the arrival of the second chick! A short while later, viewers noticed eggshell on the side of the pot, and at one stage, PPO picked up a piece of (presumably) eggshell, and ate it. Very exciting and can't wait to confirm Chick no.2 tomorrow. Very cool!! Very exciting!! Mom is so Beautiful!